Project Wonderful still hasn’t approved us for ads. Perhaps later today. Half of this comic makes me happy, the other half breaks my heart. D: Some people can be a bear to be around, but sometimes there’s a reason for it. Sad when no one really tries. Floyd’s boxers and socks match his shirt. I just died laughing. Loving the different ghost hairstyles too. Also, I’m stealing the snap-activated lava lamp. It’s pretty and will look nice next to my blue bullet-shaped one. Which is sadly not snap-activated. Some of my friends were watching me draw this. They have me hell, taking the second-to-last panel out of context and… yeesh. XD Come on, Floyd is the only person in this room who is NOT sleeping *completely naked,* after all! Poor Ecta! I’mma have to beat a couple o’ ghosts here… I’m this close to ruining the sanctity of your G rating. That is one bright lava lamp. lol its more pg13 rated. What? Come on, we haven’t even had KISSING. Man, if you ruin our sanctity, it’s all over. Then we might as well put all kinds of stuff into this comic. Well, he could be magically snapping off the lava lamp and the room light simultaneously. But it could also just be that it is, indeed, a magical super-awesome super-bright lava lamp of power. and whaddya mean “Of course you can tell which ones are the girls by other means”? You forgot the creaking door. I am disappointed, son. Aww, I’d like to, but we give cameos to people who donate, so it wouldn’t exactly be fair to them, would it? And yay Davis for asking why he can’t sleep on the couch! I love drawing him out of uniform. Maybe Casual Day is in order at the castle. The boss shouldn’t complain; it’s much less disruptive than Bring Your Slobbery Sucker-wielding Kid Day. But the slobbery sucker-weilding kid was so adorable!!! Skärva doesn’t really grasp the concept of “adorable.” All he knows is that when Lorelei gives him puppy-dog eyes he nearly throws up and he doesn’t like that feeling. Same thing happened with Davis, that’s why he got hired. Hm… well, I do see where he’s coming from with Lorelei (the only thing I like about her as of right now is her name), but Davis is amazing. Ecta is lonesome. I’d give her a hug but…. well… she’s a ghost..
Floyd, keep your shirt on or you won’t be able to stop the fangirls! chills you to the bone. like years of being alone. I feel like that applies to Ecta’s situation. She has co-workers sure, but no one she hangs out with as friends… So that’s why she’s so bitter all the time! 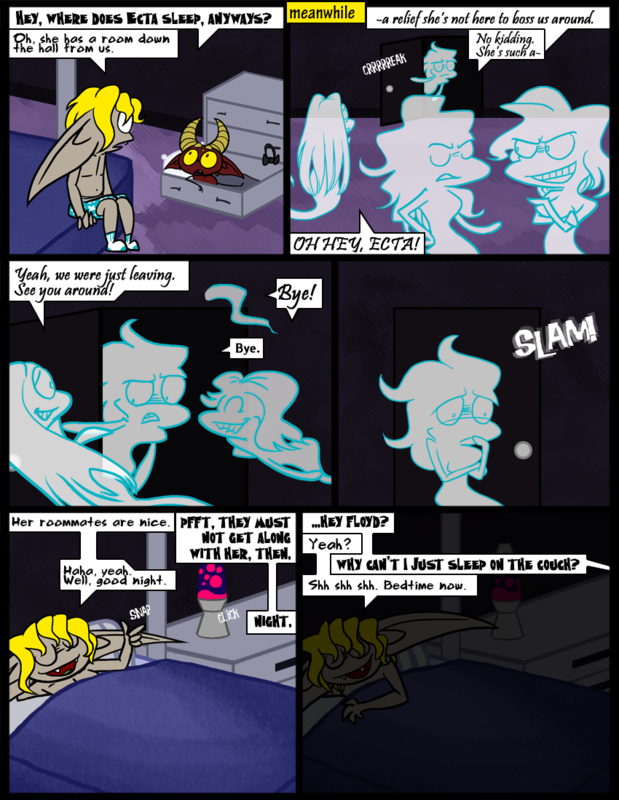 Yeah, before drawing this comic, Victor and I had a talk about whether ghosts sleep. I suggested that they wouldn’t have to sleep, but he said “Yeah, they also don’t HAVE to work.” There’s a reason Ecta does both. Is she so mean and controlling because she has no friends, or does she have no friends because of that? It’s an endless cycle, but I’m sure Ecta’s always been difficult to deal with. altermentality- i agree with you all the way. so sad for Ecta, ironicly sad for Davis, and Floyd is awesome. Meh, that snarky little devil probably deserves to spend some time in a drawer. No one’s stopping him from moving to the couch, anyway. Aw, poor Ecta! I know she’s bossy and can be a pain, but I feel bad for her anyway. And I’m glad Davis brought up the couch. I was wondering why he couldn’t sleep there, too! The ghost on the right’s smile in the third panel looks totally honest. Totally honest. Totally. Do have to say though, I read this all in one sitting, and I think I may have a crush on Skarva. XD; Something about hapless villains warms my heart. Woo! Thanks, I’m glad you liked us enough to read it straight through I look forward to seeing you around! By the way, I just found this comic from an add on Awkward Zombie, And I have to say, It was well worth the time to read the whole thing! It’s brilliant. Aww, thank you so much! Awkward Zombie is always good for us. Gotta say, a year ago I would have never thought that I’d ever have an ad for my own comic own Katie’s site. Just goes to show you what can happen when you have boyfriends who pester you – I mean, believe in you! Just finished the entire archives. Awesome comic! I think I’ll be comin’ back for more! So do I. Very much!